← Help! Save the baby! We attended our first Really Really Free Market. Many towns have their own Really Really Free Markets. got the invitation for last month’s market, but our calendar fills up so fast that I needed more notice to prepare. Anyway, my younger two kids accompanied me, and they left feeling happy with a couple of new finds each. I was happy to have someone take my photo paper from a previous printer. 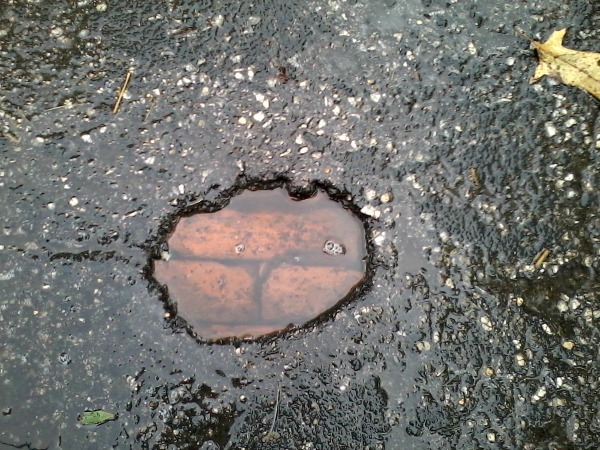 What is under the asphalt? Bricks! A brick street. I should have handed her the camera then and there, but we were excited about the market. We almost forgot about the brick street when we were leaving because the weather turned rainy and unpleasant. We ditched early. I feel lucky and thankful that she got this photo to share with everyone. This entry was posted in blogging, frugal family and tagged brick street, really really free market. Bookmark the permalink.